Gunda moved to a beautiful part of the Caucasus, Abkhazia, and fell in love with Abkhazian cuisine. 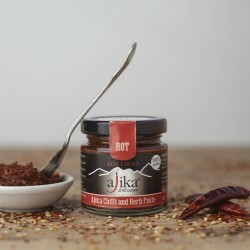 Ajika is a hot red chilli paste which Abkhazians add to pretty much everything, and its wonderful distinctive flavour and aroma makes all the difference. When Gunda returned to England she knew she couldn't live without it so asked her Abkhazian husband’s parents for their generations old family recipe, and began making ajika herself. 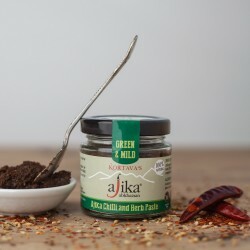 Ajika is an irresistible spicy condiment which can be used as a substitute for salt, so is believed to have health benefits, particularly because the ingredients are all natural with no additives. Gunda began Kortava's Ajika with the aim to bring ajika’s unique flavour, aroma and versatility to all UK spice lovers. 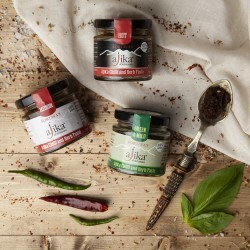 Their hot variety of ajika was featured in Best Brands of Fine Food Digest as the Editor's favourite pick of 2017.